Levi is the reason I began baking allergy free. 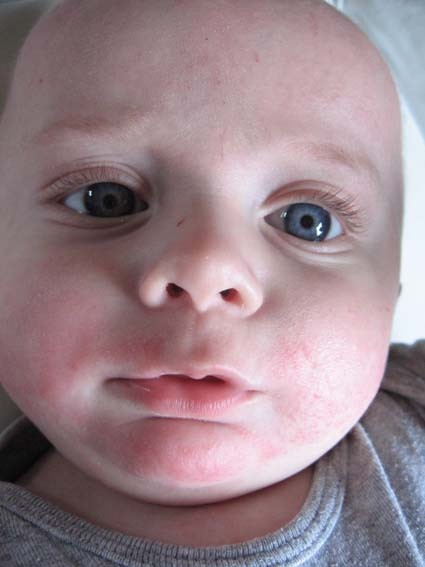 He had sensitive skin from birth really but from around five months old Levi’s skin started progressively getting worse. Rashes were all over his body especially his face and he was vomiting, had red itchy eyes and was sometimes wheezy too (particularly after his bath we noticed). I visited my doctor and we were both convinced that allergies were to blame for the eczema. I was convinced that milk was a factor. Since that was his main source of food. It was when the skin began turning into wet weeping eczema that I was referred to the hospital. 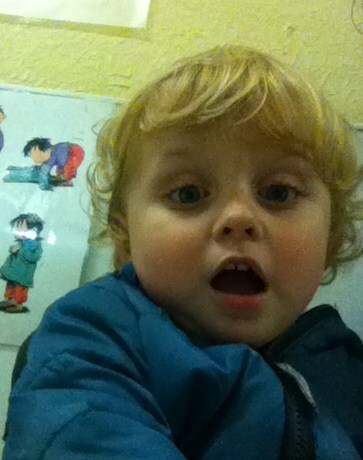 I was feeling despair that the eczema bath oil plus creams were not stopping his skin from becoming worse. I am glad I took the pictures as a record now as it got so bad. Below was when it was at its most severe. It makes me feel awful just looking at that picture, poor little man. 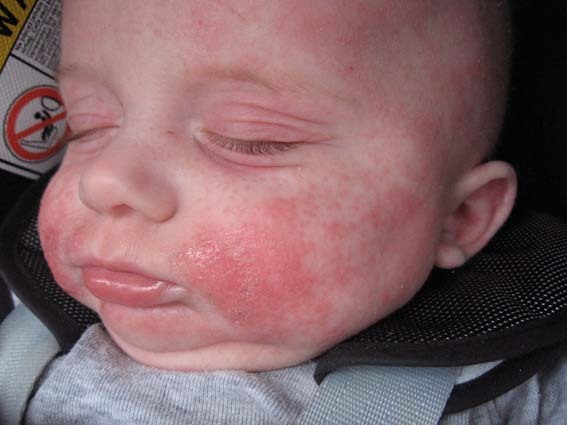 After then seeing a pediatrician and a dermatologist and eventually having some RAST allergy tests done it emerged that Levi was allergic to cows milk and potato. I was referred to a specialist dermatologist who then carried out some more allergy tests, this time scratch tests on his back. She tested for common allergens; milk and potato (to confirm), egg and peanuts which all came back positive. We were particularly concerned about the nut allergy. It then became clear why his skin had become so bad and why he had been wheezy after baths. The dermatologist realised that the bath oil he had been prescribed for his skin actually contained nut oil and even though I had reduced his bath time to once a week it was why his skin was becoming worse not better. The amazing thing was that as soon as we ceased using the oil and changed his milk his skin recovered to almost perfect in a matter of about a week or two. At age one he was allergy tested again. He was still allergic to all he tested positive for before as well as tree nuts and soya which he was additionally tested for. 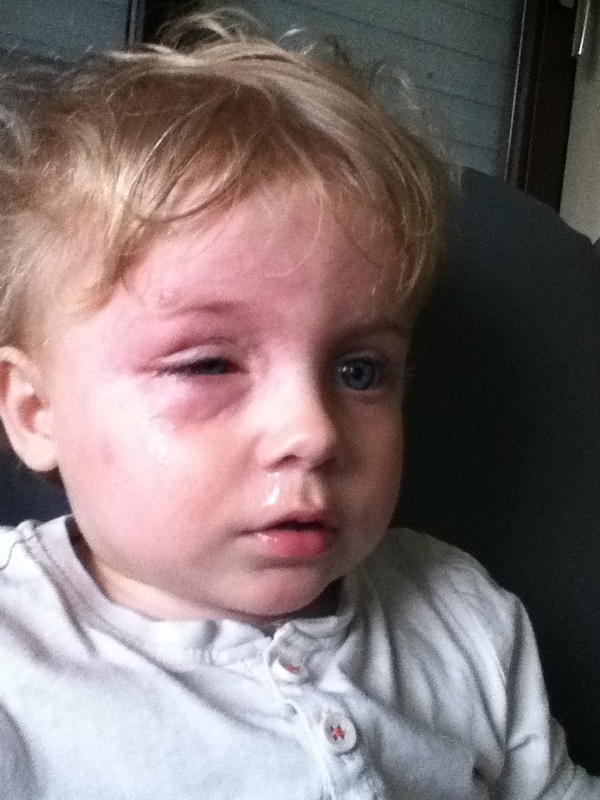 We think that his egg allergy is quite severe. 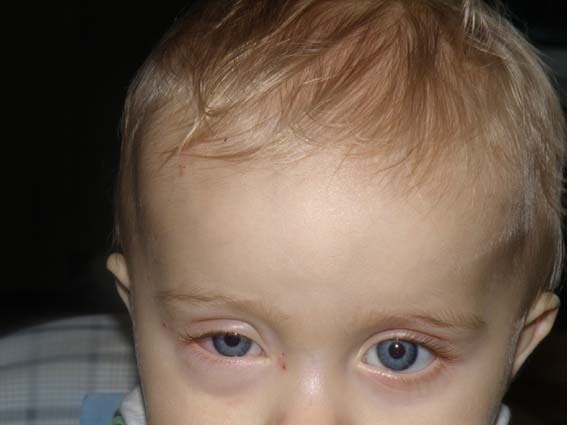 He had a reaction in november 2009 when hie eye swelled almost shut in minutes. These pictures were taken a little while after when the swelling had gone down a lot but his eye was so swollen. I should point out he was also a bit wheezy with this reaction which was another pointer towards nuts for us. He has recently started school and so far no reactions. He has to be watched closely, especially after the other children have been eating but luckily we are doing well at the moment. He is due for more tests soon so hopefully some good news that some of the allergies are starting to decrease in severity. Time will tell. He’s a good boy really, takes it all in his stride and mummy bakes him treats every now and then so he doesn’t feel left out. One day soon he will start to realise he is a little different from the other kids at school but for now I don’t think he realises and hopefully we can work around those future issues the best way possible so he feels happy with it all. Goodness Bev! Poor litte Levi. He looked so sore in some of those pics :(. You are definitely lucky to have the doc so close by. I hope he grow out of all his allergies soon. Have you read about the research they were doing at Addenbrookes in Cambridge (I think) where they have managed ‘cure’ a group of children with peanut allergies? I know, the peanut trials are very exciting especially as the re trials showed such a huge success. I am hopeful that it will help Levi in the future! 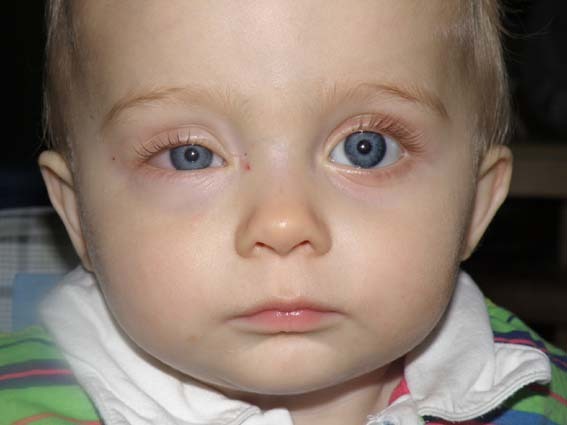 His eye was the real shocker as I took Ollie for his nap walked back into the living room and it was swollen shut. Ollie had scrambled eggs for his lunch and we think he rubbed Levi’s hand in an affectionate way (there was a rash on his hand too) then Levi rubbed his eye. We hardly eat eggs now, just when the kids are in bed really or we are REALLY careful! that was meant to be “pre trials” not “re trials”! Hi, I know what you are going though my daughter is now 6 but between around 3 months and 3 years she was dairy intollerent. She was a very wheezy baby and covered in eczema. She has grown out of that but she developed an allergy to tree nuts and coconut. She is particularly bad (grade 5) to hazlenuts. it is the coconut allergy that causes us the most problems as nearly all soap products are made with SLS (sodium Laurel Sulphate) which is made from coconut oil. She has to carry an epipen and emergeny dose of piriton in case she injests hazlenuts as she will go into anaphalaxis. 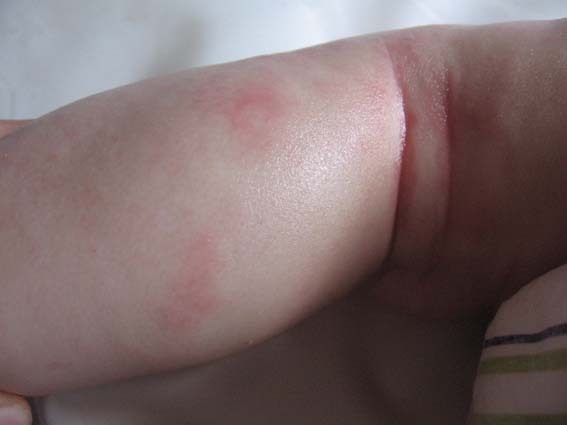 The coconut oil causes eczema but it is almost impossible to avoid it. I have found Lush products to be a good send though. Alot of their bath ballistics are SLS free and they do Dream cream and dream wash which are fantastic. I also found Alleppo soap which is made from olive oil. the foam from the soap can be used as s shampoo and when she is old enough it can also be used to shave with. its around £5 a bar but seems to last forever. Your story is a very familiar one to us also, and the photos just brought it all back. We are a UK-NL family with a probably same-aged son as Levi, living in the UK so shopping isn’t such a nightmare but we’ll definitely be following your very useful recipe posts now we have found them. Thanks! I can tell that this severe of allergies isn’t common, that’s a good thing. 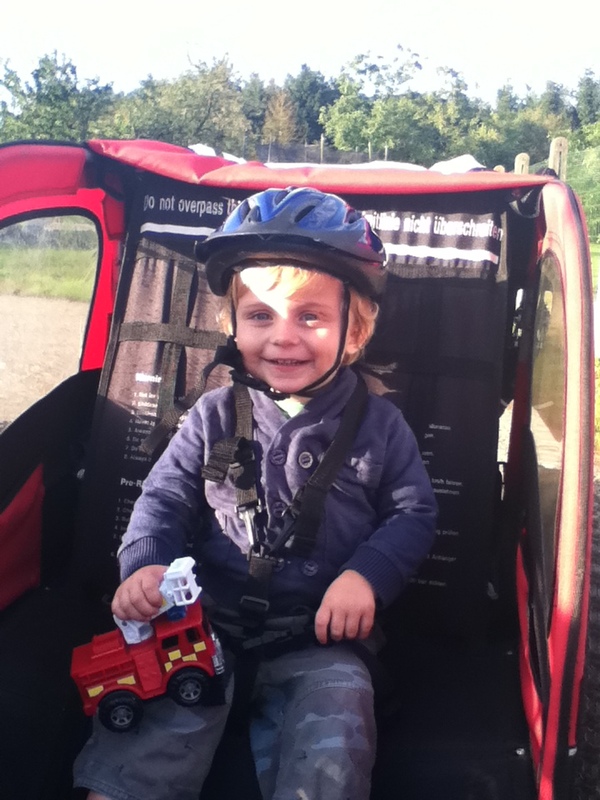 My son, now 10, was extremely allergic to milk, milk products and eggs when he was a baby and until about 6 years old. We had an epi-pen. He was also intolerant to kiwis, strawberries and cats. He is better now, but I still don’t give him much cow’s milk and milk products because he always feels sick after having some. The doctor says he’s not allergic anymore, but I think he’s probably intolerant now. Because he was never allowed to have all those things until 6 years of age he never developped the taste for them. He especially thinks eggs are gross. LOL There is hope ladies, we just have to be patient and creative with our little treasures don’t we? Take care and good luck! Super maom!!!! Really!!! Levi is so lucky to have you! !